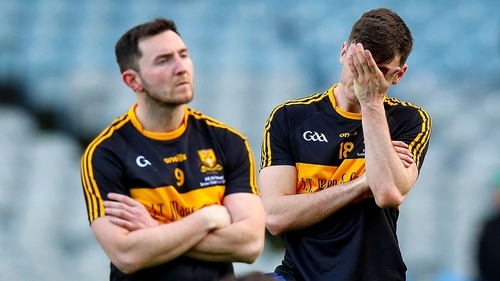 Dr Crokes selector Niall O'Callaghan openly doubted whether John Payne's first half dismissal had a major impact on the result as the Kerry champions were overwhelmed by Corofin in today's All-Ireland club football final. The St Patrick's Day decider was eagerly anticipated and widely billed as a battle of champions but it descended into a blowout as Corofin hit Crokes for two first half goals and the Kerry champions saw their defender Payne sent off for kicking out at Dylan Wall. The Galway aristocrats became only the fourth club to claim back-to-back All-Ireland football titles with the final scoreline reading an emphatic 2-16 to 0-10. Crokes selector O’Callaghan praised Corofin's class and dismissed the notion that the red shown to Payne was pivotal. "We got schooled by the best team," he said, "You can say nothing went right and you can give all the platitudes and excuses you want to give. We were beaten by a far better team. Congratulations to Corofin. They showed us how to play a game of football. They're All-Ireland champions and they're not that for nothing. "We came in today with no excuses, none whatsoever. Every fella was fit, every fella was training. We were confident coming in and at the end of the day Corofin beat us. "They played us better, they took away our strengths, they played really good football. You can say the sending-off was a turning point, it wasn't really. We can be honest enough, we were beaten by a better team." O'Callaghan's fellow selector Edmund O'Sullivan admitted that Crokes had no answer to Corofin's offensive running game: "In hindsight, we could have gone a bit more defensive, maybe put in a sweeper or two sweepers and stop their runners but it’s kind of not in our DNA. "We’re an attacking team. We play to our strengths, we put up big scores and we just couldn’t get the ball in the middle third today to give our full-forward a chance to put up big scores for us. "It’s not the end of the world for the Crokes. I’m sure a lot of clubs in the country would be happy to be in this position. There are young fellas coming through, they are in two All-Irelands in three years and won three county Championships. As for whether today was the last time Colm Cooper will wear a Crokes jersey or grace Croke Park, O'Sullivan said: "I’d hope not. I thought he did quite well when he came on. Obviously, it’s a conversation we will have to have with Colm but I think he has a huge amount to offer. "I don’t know if he would be prepared to operate from the bench."